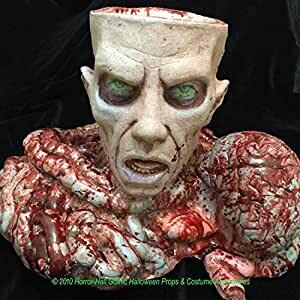 Creepy Bloody Severed ZOMBIE HEAD BRAIN BOWELS SNACK SERVER CANDY BOWL PROP-Mad Scientist Laboratory Butcher Chop Shop Meat Market Scary Halloween Spooky Haunted House Horror Decoration Kitchen Dining Bar Decor Deluxe Life Size Severed Human Zombie Head with Scattered Brain and Bowel Candy Bowl is just what you need to scare those party guests. The perfect candy bowl display snack server for any haunted house kitchen, dining, bar or Halloween costume party decor! The top of the head has been removed so you can place candy on the inside with plenty of intestinal goo scattered around. Makes a horrifying addition to your apocalypse or mad scientist laboratory or butcher meat market or chop shop. Get the right kind of candy and it will look like you are giving away BRAINS! *Insert your own bowl (NOT included) up to 5.5-inch diameter, and fill with your favorite dip or salsa! Made of high quality foam filled latex. Total Prop Size approx 20-inch wide x 17-inch deep x 12-inch high (50×42.5x30cm). Head Size only approx. 11-inch tall x 10-inch (27.5x25cm) diameter. Space to hold bowl approx. 6-inch (15cm) Long x 5.5-inch (13.75cm) Wide x 1.75-inch (4.38cm) deep.Recommended for indoor or covered porch use only.